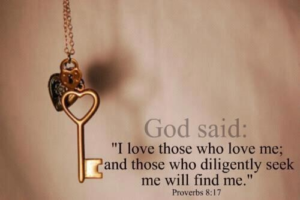 Diligence is a key and primary ingredient in both seeking and serving God. To be diligent and function in diligence is to put forth constant careful effort, preserving in hard work with steady effort, painstakingly. Half-heartedness is not acceptable with God. Jeremiah 29:13 tells us that we will find God when we search for Him with all our heart. Again in Jeremiah 17:24-25, God assures us that when we give careful heed to Him, we will be the recipients of His continuing blessings. Hebrews 11:6 shows us the absolute necessity of having faith in God as we come to Him, but it connects another word in the equation of receiving His reward, “those who diligently seek Him.” Yes there it is again, diligence! This is in keeping with Jesus’ teaching in Luke 18:1, where the message of the parable is “that men always ought to pray and not lose heart” (or as the King James says, “not to faint”). That is real persistence; persistence like the woman in Matthew 15:21-28 when it looked for a few moments like Jesus was rejecting her and her request for her daughter’s deliverance, but her persistent faith brought both commendation from Jesus and healing for her daughter! In another setting, Matthew 11:12, Jesus taught that we enter the kingdom of heaven by force, or crowding our-self into it, forcing our way past the powers of the enemy in energetic pursuit, seizing the kingdom territory and claiming it like soldiers in a battle. Diligently listen to and obey Me says the Lord your God. Earnestly and diligently seek out My ways and the work I have for you to do. For I am a rewarder of those who come near to Me and believe that I will bless them for their labor for Me. Diligently do My works. For I will render to every person according to their works, justly and according to what their deeds deserve. Diligently take heed to what I tell you; don’t just be a hearer and not a doer. He that knoweth to do good and doeth it not to him it is sin. Be diligent about reading My word and telling others about what I am saying. Be diligent about praying and seeking Me, and My power in your life. There is much wasted time in your life; you have been spending your time doing things that don’t count for eternity! Scripture quotations are from the New King James Version copyright 1982 by Thomas Nelson Inc. used by permission.